Jacob Hunt is a teenager: brilliant at maths, wicked sense of humour, extraordinarily organised, hopeless at reading social cues. And Jacob has Asperger’s. He is locked in his own world – aware of the world outside, and wanting to make a connection. Jacob tries to be like everyone else, but doesn’t know how. When his tutor is found dead, all the hallmark behaviours of Jacob’s syndrome – not looking someone in the eye, odd movements, inappropriate actions – start looking a lot like guilt to the police. And Jacob’s mother must ask herself the hardest question in the world: is her child capable of murder? I read House Rules for book club, for me it’s one of those books that I wouldn’t have picked up unless it was for something specific like book club. 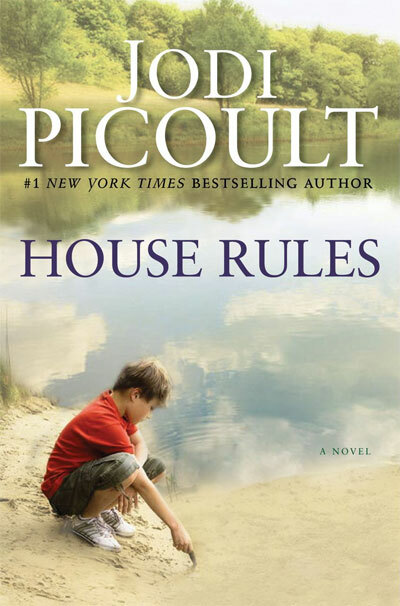 This is also the first Jodi Picoult novel I’ve read and if House Rules is anything to go by, then I’m never picking up another Picoult novel unless it’s for something specific. Like book club. Picoult’s characters are easy to relate to, the topics and issues presented are easy to pick up and digest, the story itself is easy to follow and read, but just because a book is easy in certain parts does not make it easy to swallow. The characters are easy to relate to, but they aren’t distinctive in relation to each other. Picoult shares the novel from several different character P.O.V’s, which could have worked well if the characters didn’t meld and they didn’t share the same information. There’s quite a lot of information dumping via character’s reminiscing and at times each character who was involved in the past event mentioned doesn’t necessarily share a different aspect of that event like you would expect, but the same details. This results in not receiving the whole picture about the situation as if all the pieces are coming together and because the characters meld so much sometime you have to double check who the character is; I know I had to several times and other readers in my book club had to too. The topics and issues are easy to pick up, but that’s because it’s repeated over and over again, you can’t help but pick it up. I think that sometimes a reiterating of certain facts is needed to help them sink in, but with Picoult’s style it’s very easy to get the idea of how Asperger’s Syndrome and the characters work in this story. Repetition of Asperger’s Syndrome symptoms and reactions isn’t needed and after awhile it makes you questions if the writer thinks her audience are a bunch of idiots. It doesn’t mean that she does, but I’ve come across this in other stories before, where the writer has written in such a way that it feels patronising and as if you are an idiot who needs it all laid out for you. To me, that is not only something to avoid in writing, but is also a way to lose readers. The story itself is easy to follow and read because it’s so bloody predictable. I figured out the storyline very early on and the whole crime at about the 140 page mark. I wasn’t sure if this was because I have a writer’s mind and am coming up with scenarios every day or because it really was that predictable so I went and checked out reviews and what do you know? Predictable! One other problem I had with House Rules is the technique to keep the reader going, the hook that is in every book (haha yes I just did that! ), and with House Rules it mostly comes down to this; the lack of one question, what happened? No one asks Jacob, the boy this is all revolving around, what happened. Granted this also shows how much people don’t listen, but I don’t think it’s a clever way to get a reader to keep going, it’s a cliché, and it also makes me feel as if the writer was bored. House Rules does help you see something from a different perspective and it does help that there is a small dose of humour, but I’d only recommend this to certain people; those who don’t mind clichés, those who read very little, and anyone who wants a generalised way of learning about Asperger’s Syndrome. Demographic: General Fiction readers or people interested in learning a little about Asperger’s. I am amazed at the level of Jodi Picoult’s research. She captured living with an Asperger’s older child, and really saw the mother’s pain. I have an Aspie daughter who was diagnosed in her late teens. The mother’s voice was so real I sometimes had to put the book down and walk away. She also plays out and Autistic parent’s greatest fear: that your amazing and smart child will be publicly misunderstood by school, or government, or legal system. It’s not the best Picoult by any means but some of her stories are wonderful please don’t let this one deter you! I would suggest The Pact, My Sisters Keeper or Plain Truth as some of her better pieces though the format is the same for all her novels – each chapter from a different characters viewpoint. Most of her novels dont have cop out endings either!